If you are seeking restitution away from the pressures of everyday living, enjoy "glamping" without the fuss. Our lakefront yurt & cabin is sure to re-connect you back to nature and explore the ultimate Algonquin experience. 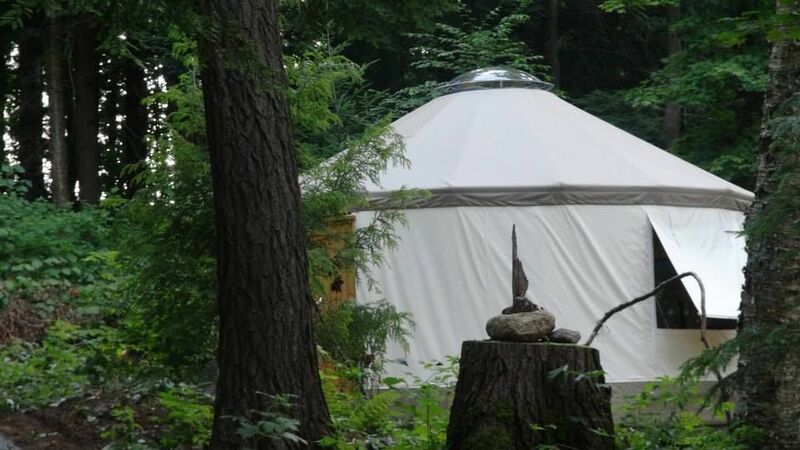 When you arrive to this 100% Canadian made yurt /cabin will be clean & setup with freshly laundered queen size bed sheets, towels, basic cooking utensils, cutlery, plates, starter supply of paper towels, toilet paper, dish soap & hand sanitizer. Propane bbq c/w cooking burner, extra propane tank available. This off grid package also includes: unique outdoor privy, BBQ c/w propane, open fire pit, starter supply of kindling /firewood, private dock, waterfall, stream, muskoka chairs, ample selection of games & reading material (for quieter moments), and a small solar power pack to operate small appliances. Seasonally we supply a complimentary canoe c/w two life-jackets from mid spring to early fall and 2 pairs of high-tech snowshoes during the snow months.